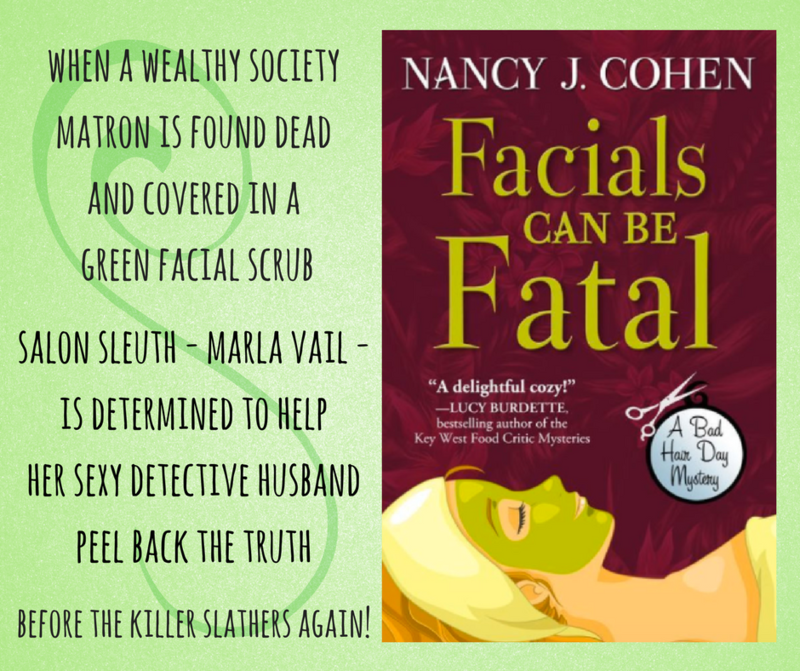 TODAY'S REVOLVING BOOK is FACIALS CAN BE FATAL, Book #13 in the popular BAD HAIR DAY cozy mystery series by bestselling author NANCY J. COHEN. During the frenzy of the December holidays, the last thing salon owner Marla Vail needs is a dead body slathered in a green facial mask at her new day spa. The victim, Valerie Weston, had been a major donor for Friends of Old Florida, a historic building preservation society. Marla’s stylists are scheduled to work backstage at their upcoming gala fashion show, but Val’s demise might put a crimp in their plans. Hoping to salvage her reputation, Marla determines to track down the suspects. Although Val had been well-liked by most people, she may have stumbled onto secrets that others would kill to keep. As more bodies pile up, Marla races to uncover the clues. What are the connections between a greedy land developer, a dress designer whose husband may have links to the Asian mob, a mortician who might be involved in the human hair trade, and members of the non-profit group’s board of directors? Are the latter as dedicated to their cause as they’d like Marla to believe, or do they have their own self-interests at heart?